Search Quality Highlights are back, with a strong focus on quality, relevance, auto complete and local search. Local search was an expected avenue of focus as previous Google Inside Search highlights honed in on mobile search results. Is your business location based? The LTS change works to improve the results for users who are looking for services in your suburb. This is a nice update, particularly for small business owners competing against much bigger fish (with bigger SEO budgets!). Update #83709 was made to improve the way links are used in ranking. As Google recently confirmed in their 20th Panda update, exact match domains with low quality pages are the latest losers in SEO. This change will handle stale content in what Google describes a more “granular function”. So what does this mean? Google understands the fact that not all businesses need to update their website everyday to be seen as relevant. Many existing sites provide all the information that their users seek. This removes the fear from many responsible for their businesses websites to update their content or miss out in SEO. What will be taken into account instead will be based on each documents age. Project Snippets wants to ensure that your page title reflects the content that you have on your page. This is nothing new to anyone that knows SEO, but the Project has been refined to increase relevancy. A reminder to create and build content for users, and NOT the search engines. Another improvement to retrieve local web results for users. According to Google, this update will be “better able to identify web results that are local to the user, and rank them appropriately.” A better ecperience for users, many of whom may not include their local area while conducting Google searches. “A description for this result is not available because of this sites robots.txt – learn more“. If you witness this message on a page that should have no reason to have this message, speak with your web developer about identifying any issues in the robots.txt file that could be blocking search engines from viewing your page(s). Search quality changes #82862 and #83689 were launched in August to help users find more high quality content from trusted sources. #84010 was a Google Panda Update that refreshed the level of ‘high quality’ results, an algorithm improvement that noticeably affected 11.8% of search queries. To learn more about high quality sites in search, head on over to the official Google Blog. Another change dedicated to improving the relevancy of local search results for local search queries. Further improvements were made in September to improve the retrieval of high quality content in the SERPs. A reminder to produce original and helpful content for users rather than search engines. If you regularly produce content, this website will work to show users the most recent item from your website first if you have several pages related to the same query. A greater reason to continually update your site’s blog or company news page. An improvement to titles shown in search result snippets. Combined with our 4th highlight from August – this is a push to get site owners to increase the relevancy of page titles for users and not search engines. Just earlier this week we talked about The Bacon Number, a search that calculates the degrees Kevin Bacon has with any other prominent entertainers. This entertaining search relies heavily on the use of Google’s Project ‘Knowledge Graph’, which was launched in May and has been a strong focus of search quality in both August and September. 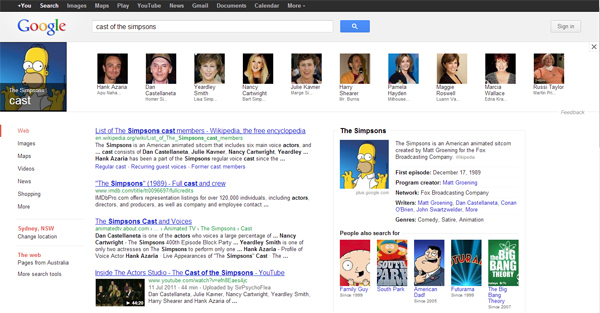 To see Knowledge Graph in action, simply enter in a search query like, “cats“, “dogs” or “cast of The Simpsons“.